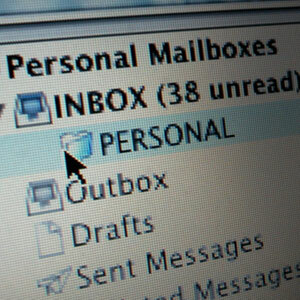 It’s Friday, and inbox zero claims are popping up all over the place as we wind down the week and try to get ourselves to believe that we really do control our email and not the other way around. What is “inbox zero,” why is it such a coveted status and is it realistic in today’s email-focused world? Inbox zero is a term used to describe your empty email inbox. It means you’re on top of the email game; you’re in charge of incoming information; you rock. Merlin Mann, of the productivity site 43 Folders, is the brains behind the phenomenon. He speaks on how to achieve and maintain an empty inbox, and has a plethora of information on managing email for the email-challenged. Like most people, I want an empty inbox. It’s less stressful than having hundreds of messages begging for your attention when you open your email; having complete control in the email arena is desirable and empowering. But I also know that inbox zero just isn’t sustainable or realistic, unless you want to become a slave to your inbox. I’m a pretty (OK, extremely) systematic and organized person, yet I very rarely achieve inbox zero. The nature of email â€“ instantaneous communication instigated by others that we typically can’t anticipate â€“ means that it will never stop. You can make a hundred rules and filters to sort, move and delete messages as they hit your inbox, but you will never catch everything. You will never be able to maintain an empty inbox unless you route all incoming messages to a folder other than your inbox. And then you’re just moving, splitting up and scattering the mess to give yourself a fake sense of security, a mock control over your email. Inbox zero is a myth; focusing on achieving it is a waste of time. There, I said it. Sure, you may empty your inbox on a Friday afternoon, but what does it look like on Monday morning, and how much time and effort do you expend to get back to zero for a few minutes before the next onslaught? Call me crazy, but this just isn’t a good use of my time. Despite my criticisms of the inbox zero philosophy, I do think there are some valuable lessons to be learned from it. When you take away the literal application, inbox zero offers some quality email management tips. Things like the importance of developing an ongoing process for managing incoming information; prioritizing and weighing the value of different messages appropriately; the need to become a liberal deleter. If you read through his posts, you will see that Merlin gets it. It’s the masses that fall into the trap of thinking an empty inbox equals uber-productivity and bulletproof organization. I wish that were the case, but it’s just not that simple. So where does this leave us? We still need some way to manage our email effectively, and spend less time doing it. There may not be one universal answer, but there are some possibilities. Read on to explore them.